If you’re not already analyzing and optimizing your website, now is the time to start! 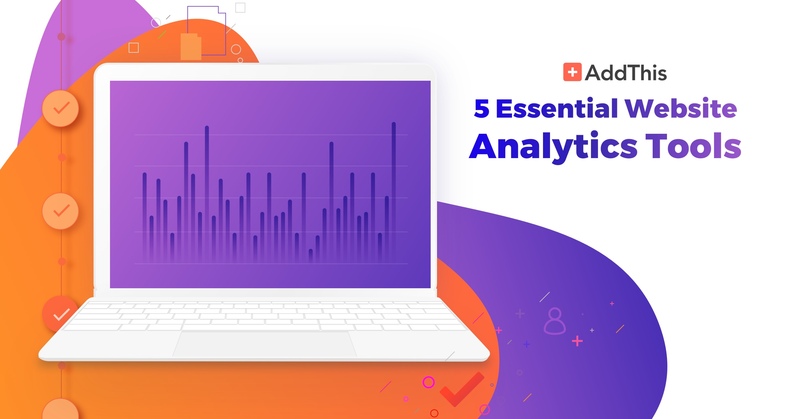 To get you going, we’ve assembled our recommendations for the top five essential website analytics tools to consider using to improve your site’s business performance. Larger companies can afford to hire data scientists who spend their days collecting, transforming, and crunching data to find the opportunities to exploit and then improve the site’s performance. Marketers in small and medium-sized businesses instead rely on analytics tools to help them understand what’s happening on their websites and to discover ways to make their efforts more effective. Using these tools usually involves three steps: capturing website activity data (how are visitors using the site now? ), analyzing the data to find insights and opportunities (how can the visitor experience be improved? ), and taking action (how can the site become more effective and successful?). 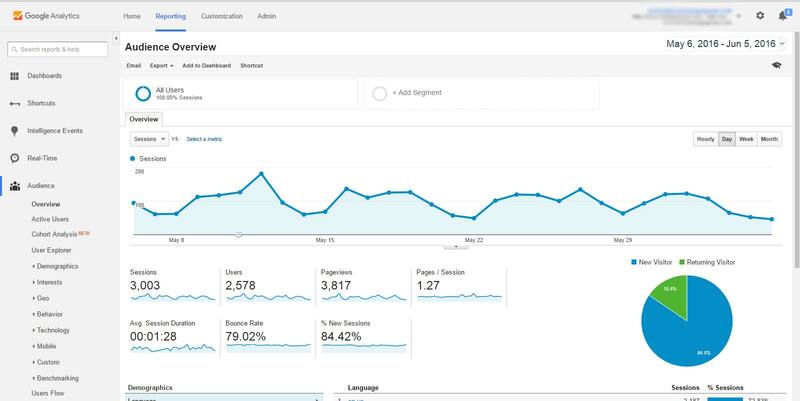 Some important metrics to track and optimize include visits, unique visitors, returning visitors, bounce rate, time on page, referrer quality, visitor paths through the site, funnel performance, and conversion rates. Beyond simply having access to “snapshots” of these metrics, it’s important to track them over time to learn what trends are occurring and how well your improvement efforts are working. More than half of all websites use Google Analytics, and for good reason: it’s powerful, it does a lot all by itself, and it’s free (for websites with up to 10 million hits per month). By installing a small piece of code on every page in the site, Google Analytics will capture basic activity metrics. (Heads-up: capturing interactions with specific elements within pages, like buttons and videos, requires additional setup.) You can then log in to the web interface to review all the stats and generate a wide range of detailed reports that describe how visitors interact with your website. The built-in reports make it easy to get started, though there is a learning curve if you want to build customized reports. Also, some of the more advanced features, such as a goal tracking, require adding custom code to specific elements in your site, which may be a barrier for some small businesses. Plus, it’s estimated that nearly half of all sites using Google Analytics also use one or more additional paid analytics tools. Click here to get started with Google Analytics. At the higher end of the website analytics space is Kissmetrics. Better suited for larger and more complex e-commerce websites, Kissmetrics powerful segmentation and precision targeting features help marketers understand and engage their customers throughout their purchasing journeys and customer lifecycle. This makes it no surprise that access to Kissmetrics starts around $500/month. Kissmetrics is a customer-focused system, with Funnel & Activity reports that many marketers swear by. Kissmetrics also tracks key metrics over time, helping marketers understand their progress as they work toward their business goals. Unlike the other tools mentioned here, Kissmetrics actually includes tools for engaging with customers via highly targeted email and Facebook campaigns. Hotjar is one of the leading “heatmap analytics” solutions (others include Clicktale and Crazy Egg). Heatmaps are visual representations of how visitors interact with your site and help you understand what visitors are looking for, what they care about, and how well your site meets their expectations. Many marketers find this visual approach to website analytics is more intuitive and easier to understand than the complex charts and graphs reported by the more conventional website analytics tools. 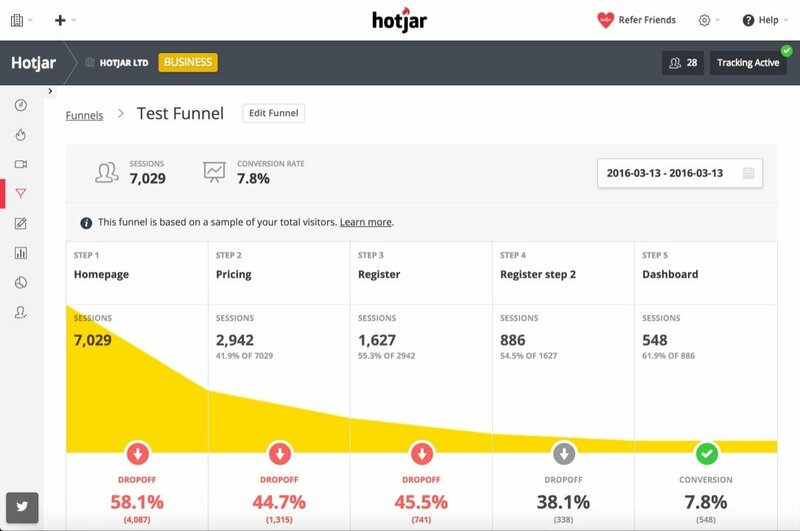 Evolving beyond simply presenting heatmaps, Hotjar now includes a wide range of analytical tools, including individual visitor session recordings (allowing you to watch everything a visitor did while using your site, including mouse clicks/movements, page scrolling, and much more), tracking conversion funnels, and form performance analysis. Hotjar also includes easy-to-use tools to proactively solicit feedback from your site visitors via feedback forms, polls, and surveys. Hotjar offers a free basic offering, with paid plans starting at $29/month for sites logging up to 10,000 daily pageviews. To get started, click here. A relative newcomer to the website analytics space, Convizit takes a different approach to website analytics. Convizit describes itself as “like having a team of virtual data scientists constantly recommending new ways to increase engagement and revenue.” Unlike the other tools mentioned here, Convizit does not require any configuration, event/goal definition, or maintenance, no matter how often your website changes. Simply install the Convizit code snippet or plugin on your site and you’re good to go. Instead of requiring marketers to understand analytics reports or determine what questions to ask to generate more useful reports, Convizit’s software uses artificial intelligence to automatically detect specific trends and opportunities that marketers use to improve business performance. So, if you don’t have the time or inclination to invest in learning how to get the most from an analytics tool, try Convizit’s free 14-day trial and see if its automatic recommendations provide enough insight to improve your website’s performance without getting your hands too dirty. While not technically website analytics tools, Facebook Page Insights and Twitter Analytics are important (and free!) tools to measure and improve your performance on these two major social platforms. To see Page Insights for your Facebook page, click Insights at the top of your page. Insights provides up to two years of data about how well your Facebook page is performing, including demographic details about your audience, where they are coming from, and how they responded to your posts. Facebook Page Insights makes it easy to understand how people engage with you on Facebook, so you can continuously increase the followers, likes, and shares your Page generates. Twitter Analytics helps you understand who follows you on Twitter, where they are coming from, and what content interests them most. There are plenty of insights available in Twitter Analytics dashboards to learn how to make your content more popular and successful among your audience. To try it, navigate to this page and click Sign in with Twitter. 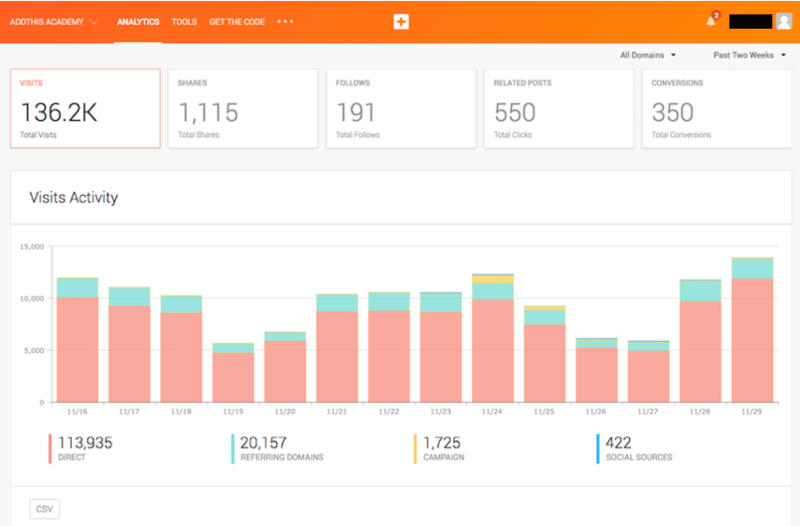 Also, AddThis provides a super convenient analytics dashboard with all our free tools to give you basic metrics such as site visits and referral data, as well as insight into how your website plugins are performing. It’s a great way to get much of the previously mentioned website data all in one place. Now that you have some specific options to check out, it’s time to boost your website’s performance! By using these tools to capture website activity data, to discover insights and opportunities, and then take action based on what you find, you will certainly make your site more successful. Do you use one of the tools we recommended? Please share any tips for getting the most from them. Do you have your own recommendations for an essential website analytics tool? Maybe a success story to share? Please share your experiences in the comments!